Jakob Gapp, the seventh child in the working-class family of Martin Gapp and Antonia Wach, was born July 26, 1897, in Wattens, a small village in the Austrian Tyrol. The following day Jakob was baptized in the Wattens parish church of St. Lawrence. After completing elementary school in his native village in 1910, he entered the Franciscan-run high school in Hall, a neighboring town in the Tyrol. Jakob was called to military service during World War I in May 1915, and served on the Italian front, where he was wounded on April 4, 1916. For this he received the Silver Medal of Courage Second Class. November 4, 1918, he was interned as a prisoner of war at Riva del Garda, and released August 18, 1919. When Jakob returned home, he learned about the Society of Mary (Marianists) from a relative. On August 13, 1930, he entered the Marianist formation program, and on September 26 he began the year of novitiate at Greisinghof, Upper Austria, and pronounced his first vows there on September 27, 1921. The young religious was assigned to the Marian Institute at Graz, Styria, where he served as a teacher and sacristan for four years. At the same time he was preparing himself through private study for the seminary. Brother Jakob made perpetual vows at Antony, a suburb of Paris, France, on August 27, 1925. In September of 1925 he entered the Marianist international seminary at Fribourg, Switzerland, which was then under the direction of the revered Father Emile Neubert, S.M. Bishop Marius Besson of Fribourg-Lausanne-Geneva ordained Jakob to the priesthood in the Cathedral of St. Nicholas in Fribourg on April 5, 1930. Upon returning to Austria, Father Jakob Gapp was involved as teacher, director of religious education, and chaplain in Marianist schools at Freistadt, Lanzenkirchen, and Graz. During a time of severe unemployment during the economic depression, while at Graz, Father Gapp’s deep concern for the poor surfaced in distinct ways. He gathered food and the necessities of life not only from his students, but also refused to heat his own bedroom in the winter, to be able to give aid and fuel to the poor. At this time, as National Socialism (Nazism) began to grow strong, first in Germany and then in Austria, the young priest Jakob Gapp developed a clear judgment about the incompatibility between National Socialism and Christianity by studying diligently the statements of the German and Austrian bishops and Pope Pius XI’s encyclical letter, Mit brennender Sorge. When teaching and preaching, he continued to emphasize fearlessly this truth. Consequently, when German troops arrived in Austria in March 1938, he was obliged to leave Graz. After a few months at Freistadt his superiors sent him to this hometown in Tyrol, since they recognized in his anti-Nazi preaching a threat to the very existence of those institutions whose elimination had already been decided by the Nazis. In Tyrol, with his relatives at Wattens, Erl, Terfans, Umlberg, and Vomp, he enjoyed the last period of peace in his earthly life. He had been an assistant pastor in Breitenwang-Reutte for only two months when the Gestapo, at the end of October 1938, forbade him to teach religion. Father Gapp had taught the uncompromising law of love for all men and women without reference to nationality or religion. In a sermon on December 11, 1938, at his home parish of St. Lawrence in Wattens, he defended Pope Pius XI against the attacks of the Nazis, and directed the faithful to read Catholic literature rather than Nazi propaganda. After this sermon Father Jakob Gapp was advised to leave his hometown. With the help of his religious superiors Father Gapp was able to escape in January 1939 to Bordeaux, France, where he served at the Chapel of the Madeleine, the cradle of the Society of Mary, as chaplain and librarian. In May 1939 he fled to Spain, where he labored in the Marianist communities at San Sebastian, Cadiz, and Valencia. For a time he was tutor for a family at Lequeitio while teaching at the school of the Mercedarian Fathers in that city. In Spain he stood alone and was always misunderstood because of his rejection of Nazism, since Hitler had earlier offered aid to Franco. Gestapo agents followed his journey from the time he left Austria, and took advantage of his inner isolation. Two individuals pretending to be Jews from Berlin told Father Gapp about their fictitious experience of flight from Nazi persecution. In Valencia they asked him to instruct them in the Catholic faith and prepare them for baptism. After gaining his confidence, they invited him on a trip, and abducted him across the border into France, then occupied by the Germans. Within a few minutes they stopped in Hendaye, France, where the Gestapo was waiting to arrest him and take him to Berlin as a prisoner. On July 2, 1943, the feast of the Sacred heart of Jesus, a feast of special significance in Austria and in the life of Jakob Gapp, he was condemned to death by the President of the People's Court, Dr. Roland Freisler. Any type of pardon or transfer of his remains to his relatives for a simple burial was denied for the reason that Father Jakob Gapp had "defended his conduct on expressly religious grounds. For an explicitly religious people Father Gapp would be considered a martyr for the faith, and his burial could be used by the Catholic population as an opportunity for a silent demonstration in support of an already judged traitor of his people who was pretending to die for his faith." At 1:00 p.m. on August 13, 1943, the anniversary of his entrance to the Marianist novitiate, Father Jakob Gapp was informed that his execution would take place that evening at 7:00 p.m. The two farewell letters he was permitted to write after this announcement are truly moving manifestations of his faith. At the appointed time Jakob Gapp was beheaded by guillotine in the Ploetzensee Prison, Berlin. His remains were sent to the Anatomical-Biological Institute at the University of Berlin for study and research, and then destroyed. The only relic remaining is the gold ring which Jakob received at his profession of perpetual vows. That ring is preserved and displayed at Haus Chaminade, the Marianist center at Greisinghof, near Tragwein, Austria. On the feast of the Sacred Heart of Jesus in 1987, Archbishop Hans Hermann Groer of Vienna officially opened the cause for his canonization. Father Enrique Torres, S.M., Postulator General, and Father Josef Leavit, S.M., Vice Postulator, directed the necessary research and documentation. 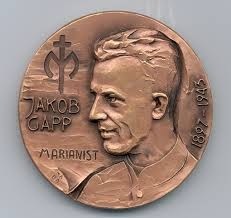 Blessed Jakob Gapp, S.M., Marianist martyr of World War II, was beatified by Pope John Paul II in St. Peter's Basilica, Vatican City, on November 24, 1996, feast of Christ the King.